Heat oven to 425°F. Grease cookie sheet. In 2-quart saucepan, mix water, butter, milk, sugar and salt. Heat to a full rolling boil, allowing butter to melt completely. Immediately add flour, stirring vigorously until mixture leaves sides of saucepan in smooth ball. Remove from heat; cool 5 minutes. Add eggs 1 at a time, beating well after each addition. Mixture will be soft and shiny. Drop dough into 8 mounds onto cookie sheet. Bake 10 minutes. Reduce oven temperature to 375°F; bake 15 minutes. Slit cream puffs with tip of knife. Bake about 5 minutes or until set and golden brown. Place on cooling rack; cool completely, about 15 minutes. Split cream puffs; remove any soft portions. Meanwhile, line large cookie sheet with waxed paper. Scoop ice cream into 32 small balls, about 1 1/2 inches in diameter. Place on paper-lined cookie sheets. Freeze until serving time. In 1-quart saucepan, mix chocolate and cream; cook over low heat until chocolate is melted. Stir until smooth. Cool until lukewarm, about 15 minutes. When ready to serve, place bottom halves of cream puffs on dessert plates. Place 3 balls of ice cream in each bottom half. Top with additional ball of ice cream to form pyramid. Cover with top halves of cream puffs, placing slightly off center. Drizzle with chocolate sauce; sprinkle with candies. For perfect cream puffs, be sure to heat the oven 10 to 15 minutes before baking. Bake the puffs until they're golden brown and their shape is set. Slitting the puffs with the tip of a knife will allow steam to escape and prevent a soggy interior. 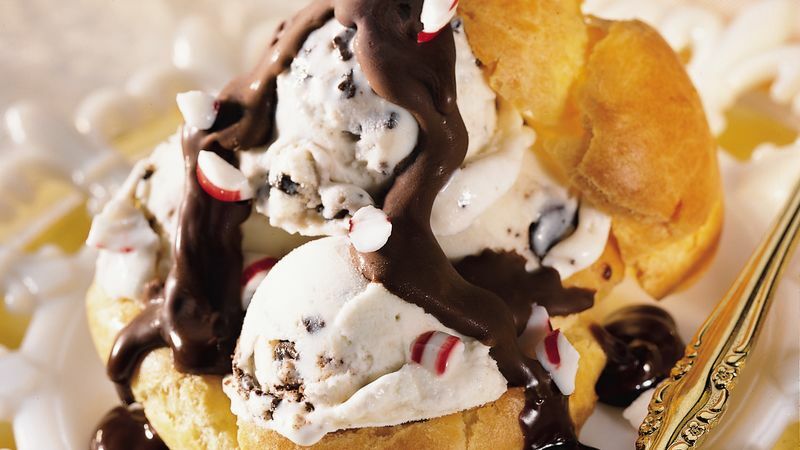 Remove ice cream balls from the freezer 10 minutes before assembling the dessert. This will allow the ice cream to soften slightly for easier eating.